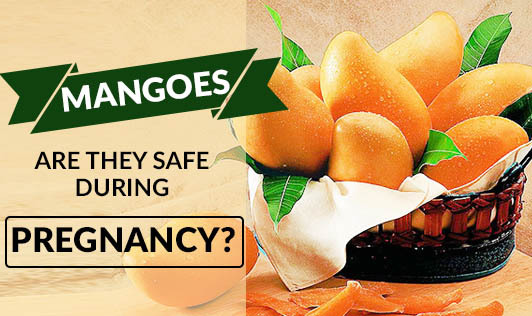 Mangoes: Are they safe during pregnancy? Mangoes can be great during pregnancy to curb cravings. Mangoes being relatively high in sugar compared to most fruits are also rich in vital nutrients like vitamin B6, A, C, and other nutrients like potassium and folic acid required during pregnancy. Mangoes are naturally so sweet that you can eat them as alternatives to cakes or pastries when you are craving for a sugary treat. But because of their high sugar content and glycemic index, it is advisable to eat them in moderation during pregnancy. Mangoes during pregnancy are especially harmful to women with gestational diabetes. When you buy mangoes from your local market, beware of vendors who use artificial ripening agents. Make sure you buy them in the season so that the use of artificial ripening agents is less. The chemical that is used is calcium carbide. Use of this chemical is prohibited by the Indian Food and Safety Standards Act (2006) and the Food Safety and Standards Regulations (2011). Note: Fruits ripened using calcium carbide can be toxic for both the mother and the baby as this chemical contains traces of arsenic and phosphorus. You can look for the following signs to find out whether mangoes are naturally ripened or artificially ripened. Artificially ripened mangoes have a greyish white or black powdery coating. They look ripe from the outside but are unripe on the inside. They have a peculiar aftertaste. They have a short shelf life. Enjoy this delicious fruit in pregnancy for sure. Just take care of the portion size & quality of mangoes.